When it comes to auto transport, there are two methods to ship a car: in an open or enclosed trailer. The more popular method is open car transport. The reason for this is its affordability. While enclosed auto shipping is perfect for luxury and exotic cars, the majority of people choose a cheaper option. Moreover, because of the high demand, there are more open car carriers than enclosed, and open car transport is typically easier to book. This leads to a faster pick-up. If you want convenient, fast, and safe car shipping at a lower price, moving your car in an open trailer is the best option. 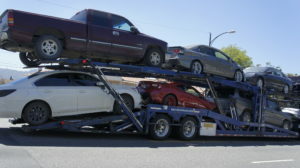 Philadelphia Car Transport provides both methods of auto shipping. We understand that you do not want to overpay for shipping your car – moreover, you are looking for the best offer. Choosing our Philadelphia open car shipping, you will get 100% safe and reliable service and save money on moving your car. Your car will be transported on an open trailer along with several other vehicles, properly secured following all the safety rules. Your car might get dusty or get some road dirt on it. But typically, those are the only things there are to worry about. If you need to ship an exotic or luxury car and want some extra protection, we recommend using our enclosed auto transport. When you ship your car in an enclosed trailer, you do not even have to worry about the dust or flies. It’s more expensive but it is worthwhile when you know your car requires special treatment. Call us for free Philadelphia open auto transport quotes. You can also request quotes on our website and we will contact you back as soon as possible. Our team is looking forward to assisting you with all your car shipping needs!